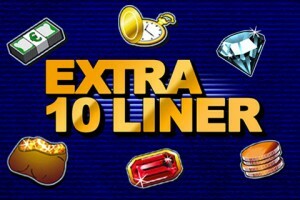 The Extra 10 Liner Slot Game is a product of the famous German gaming provider launched years ago. 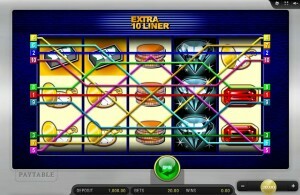 Its first version was circulated in land-based casinos throughout Europe. It didn’t take long for it to become one of Europe’s most popular slot machines. The ease of hitting a winning combination with this classical game due to its matchless winning formula and stacked symbols that allow you to attain gigantic multi-wins is what led to its popularity. It isn’t surprising that Merkur would quickly develop and offer an online version. The online version is basically the same as the original, land-based version. However, it is much improved with both visual and audio effects. Like many other slot machines, the symbols of the game reflect the theme. What theme could diamonds, bags of gold coins, ruby rings as well as other gemstones be symbols of? Each of these symbolize treasures of a luxurious and extravagant life. 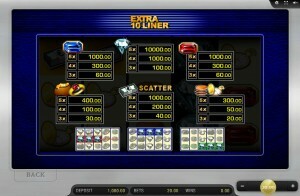 The Extra 10 Liner slot game has 5 reels and 10 paylines. As with most slots, your goal when playing is to complete a winning combination. However, Merkur created a winning formula that is unlike most other slots. This game’s winning combination is 3 matching symbols on reels that are next to each other, but they can be anywhere on a betline. In other words, the matching symbols can be in the middle of the betline, at the far left to right or at the right to left. This is different from the usual formula that requires the winning combinations to only appear from the far left to right across a line giving you a better chance to hit the jackpot. The Scatter symbol is the Stack of Money. Between 3 and 5 Scatter symbols anywhere on the screen makes a winning combination. You can see the payout of its winning combination at the Paytable. Besides the Scatter combination, stacked symbols offer an additional way to get a winning combination. A stack of symbols could have three matching symbols in the stack from top to bottom. In recent years, stacked symbols have become popular. A Wild symbol isn’t offered by the Extra 10 Liners slot game. The game also doesn’t give you an opportunity to manipulate the spin result since it doesn’t offer either a “Nudge” or “Hold” option. However, you can use your skill by playing the game’s “Gamble Ladder”. 1. You can choose not to play the Gamble game. If this is your choice, you simply click “collect” and continue playing the slot game. 2. By clicking on the Gamble Card button, you are given an opportunity to double your winnings. If you guess whether the next card to be drawn from a virtual deck is red or black correctly, you will double your winnings. If you guess incorrectly, you lose your winnings. You can continue playing until your winnings reach the limit of $140 or until you hit no-win gamble. You can bet all of your winnings or just half. 3. 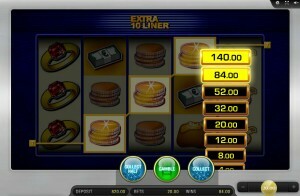 If you select the Gamble Ladder button, you are presented with a stack of blinking bars on the screen. Various winning values are on each bar up to the amount of $140. The trick is to click on the Gamble button when the higher winning value step blinks, your winnings are then increased. Even though Extra 10 Liner is basically a standard online slot, it does have several differences. 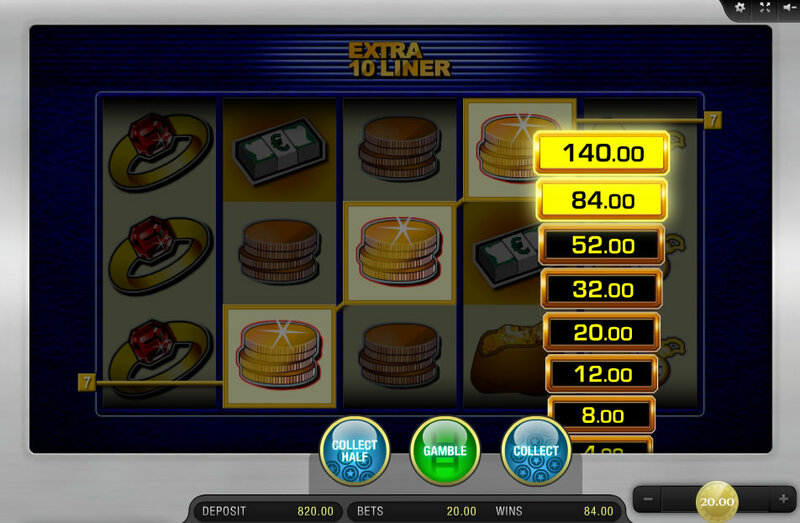 For instance, you can create a winning combination anywhere on a betline unlike other slots. It doesn’t have a Wild symbol, but offers a way to create a winning combination with a stack of symbols. If you enjoy classic slot games but like the idea of having different challenges, this is the game for you.